Because of the impetus for the anthology and the name bestowed on it, when I opened the book I expected a series of stories that revolved around themes of destruction, loss, humanity’s continued obtuseness in regards to our technology and its impact upon the environment, and how the increasingly erratic ecosystem wrecks havoc upon us. The editors certainly followed those expectations by opening the anthology with David Gerrold’s “Report from the Near Future: Crystallization.” The story, presented as a historical report rather than a character-oriented story, details a giant traffic breakdown (hello, over-reliance on heavily polluting technology that’s well over 100 years old) that so completely snarls Los Angeles’s roadways that the clean­up takes years, effectively turning the majority of its population into refugees. The story is eerily similar to James D. Houston’s “Gas Mask,” which he wrote 40 years ago and described an incredibly similar event. In fact, I went back and revisited Houston story after reading Gerrold’s and the two of them could very easily be two different accounts of the same traffic nightmare. Yet, “Crystallization” gains some added gravitas in its discussion of how some foresaw the disaster eventually unfolding, the lack of interest in their predictions, and—as the story closes—the belief that what happened in Los Angeles was an isolated event that won’t happen anywhere else. Furthermore, the eventual desertion of the city seems awfully prescient of what temporarily happened to New Orleans after Gerrold wrote the story. But that isn’t the most predictive aspect of the story. Just two months after Katrina hit New Orleans, Hurricane Rita’s path toward Houston actually caused the city to experience a multi-day gridlock eerily similar to that described in “Crystallization.” Clearly, this story fit well within my preconceived notions as to what to expect from the book. However, I found those expectations quickly negated by the second story in Elemental, Adam Roberts’s “And Tomorrow and,” a quasi-comic piece born from Shakespeare’s Macbeth. According to a quote in the introduction to the story, Roberts was “struck that the pedantic and legalistic prophecies that doom Macbeth wouldn’t stand up to 10 minutes of cross-examination in a court of law by any half-decent contracts lawyer,” which sets the stage for this version of the classic tale. Setting aside the fact the witches’ charm is fantasy, the story is science fiction at its purest, with Roberts taking the prophecies of the original play to their logical extreme. Because of the dark humor, we can brush aside the anachronism of Macbeth reaching for a dictionary to provide proof to Macduff that a Caesarian section is just as much a birth from a woman as is a vaginal delivery, and we can admire the necessity for Birnam Wood to actually reclaim the land surrounding Dunsinane. This strict adherence also allows us to revel in the absurdity that Macbeth lives for hundreds of years before finally reaching his preordained fate, and to feel sympathy for him as his fate leaves him a virtually anonymous hermit. In fact, by the end of “And Tomorrow and” Macbeth’s character is arguably more tragic than he had been in Shakespeare’s hands. Roberts’s tale isn’t the only one to wrestle with the issue of immortality. In Syne Mitchell’s “The Last Mortal Man,” we are introduced to Lysander Sterling, an internationally renowned artist who has refused the medical treatments that the rest of the world uses to prolong their lifespans indefinitely. As if his celebrity status wasn’t reason enough for the tabloid-like coverage of the story—we learn about his life through a series of flashbacks broadcast by a sensationalized media network and made possible by a neurological connection directly to his brain that allows us to actually see the events through his eyes as well as experience his thoughts — it happens that Lysander is also the great-great-grandson of Lucius Sterling, the venture capitalist whose company brought immortality technology to the world. Predictably, Lucius is dead set against Lysander’s chosen path and has tried via legal action to force him to undergo the immortality treatments. However, thanks to the second-person account of the seminal moments in Lysander’s life, we see and understand the circumstances which drove him to this choice and why he feels he must abide by it to the end. It’s a moving tale that addresses issues such a religion, choice (the story can be read as a commentary on the ongoing debate over abortion in the United States), and the increasingly tabloid-like nature of the press. Mitchell also manages a neat trick at the end of “The Last Mortal Man” that attempts to force the reader to more fully internalize the conclusion of the story. Fans of other existing sf universes will find in Elemental stories to their liking. Brian Herbert and Kevin J. Anderson supplied “Sea Child,” a Dune story set during the events of Frank Herbert’s Chapterhouse Dune. Because of the environmental themes touched upon throughout the Dune series, “Sea Child” easily fit within my preconceived notions of what to expect from Elemental. In this story, the oceans that virtually cover Buzzell — the planet the story is set on — heavily dictate life on the world. In a manner somewhat similar to Arrakis and the production of spice upon it, Buzzell is the only source of soostones, “a source of wealth in the Known Universe.” Before introducing “phibians”—a genetically modified race of humans designed specifically for living and working in oceans — the Honored Matres relied heavily upon the labor of the enslaved Bene Gesserit forced to mine the oceans for the stones. The story opens with Sister Corysta, one of the enslaved Bene Gesserit, finding an outcast phibian infant in her fishing net. Corysta, who before the arrival of the Honored Matres was originally sent to Buzzell as punishment for attempting to keep a child that the Bene Gesserit ordered her to conceive, decides to surreptitiously raise the infant, which she names Sea Child, on her own, only to be ultimately caught by her jailors. Having never read Chapterhouse myself, I don’t know what role either Sea Child or Corysta play in the book, but this story feels like an important introduction to two characters — Sea Child, in particular, seems destined to assume a major role in a larger story. The phibians’ reclamation of Sea Child at the end also serves a moving metaphor as a moving metaphor for those who lost their life to the ocean during the 2004 tsunami in Asia. Fans of Wiliam C. Dietz’s Legion of the Damned universe, as well as those who have never read a single story set in it, will enjoy his “The Run to Hardscrabble Station.” A very by-the-book piece of military sf, it’s an adventure story that’s just fun to read. Inspired by his daughter’s assignment to Supply while attending Naval Officer Candidate School, Deitz’s story centers on Ensign Tarlo Tevo’s first command after graduating Candidate School. Tevo is a Supply officer disappointed that her familial ties (her father is an admiral) did not help her gain an assignment to Intelligence. Her unsympathetic CO sends her on what should be a standard mission to resupply and shuttle troops back and forth from Hardscabble Station, which is on the periphery of human space. Unbeknownst to the two of them, Hardscabble was recently taken by a rebel group intent on ultimately attacking the Confederacy of Sentient Beings. Although slightly pedantic — after all, Dietz was in essence writing this to make his daughter feel good about and understand the overall importance of her assignment, despite how relative mundane it must seem — “Hardscrabble Station” moves at a brisk pace and contains lots of twists and turns. The very predictable ending — Tevo saves the day — doesn’t detract in the least from the story’s overall enjoyment factor. 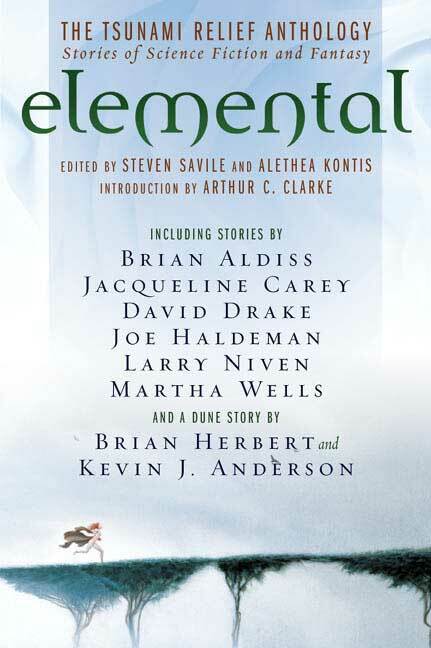 The many enjoyable stories that make up Elemental are almost an embarrassment of riches. Joe Haldeman’s “Expedition, with Recipes” shows us a post-apocalyptic world that turns the notion of a sacrificing for the children on its head. He adds an almost morbid comic touch by peppering survivalist recipes throughout a narrative revolving around a hunting expedition made up entirely of children. “In the Matter of Fallen Angels,” by Jacqueline Carey, gives us insight into how one small, rural town might handle the sudden appearance of fallen angel who doesn’t seem to move the entire week it’s there. Alongside the expected fascination and religious arguing between a couple of Christian sects over the significance of its presence is an interesting tale of how a community finds a way to grow closer without facing some sort of catastrophe or disaster. The story also works as a tribute to the type of small town where everyone literally knows everyone else, and how it’s possible for a community to come to a standstill without the rest of the world noticing. In “Tough Love 3001,” Juliet Marillier offers a look at what Clarion Workshop’s great-many-times-over-descendants might look like in the year referenced in its title. Amusingly, Marillier suggests that many of the stereotypical conceits and attitudes harbored by non-genre writers toward speculative fiction (in particular, the type of speculative fiction written by authors such as Neil Gaiman) will still be found then, but now aliens will share them along with humans. It’s up to the writer-in-residence to get this diverse group of aspiring writers to work together, and her efforts result in a surprising end to the conference described in this tale. Even more interesting is Eric Nyland’s “Butterflies Like Jewels.” In it, Dr. Robert Lang, a relatively young doctor who works at a nursing home, undergoes what might be described as a psychic journey with elements of ancient mysticism to find Dr. Ambrose, a missing doctor who works at the same facility. Because of a history of antagonism between them, police feel that Lang is responsible for his disappearance and suspect foul play. With the aid of a potent drug and mysterious pipe supplied by a patient that Ambrose tried to kill (unbeknownst to the police) before disappearing, Lang discovers he has the power to both cross dimensions and alter reality, thus ultimately discovering that the world truly is what he decides to make of it. It reads like a story you might have found in Weird Tales back in its halcyon days, and while reading it I was struck by how much easier it might have been for Nylund to construct a story where his antagonists fight this battle in cyberspace, where we are now used to seeing these type of engagements play out (the scene where Lang and Ambrose do battle could’ve come right out of a more fantasy-oriented version of The Matrix). Yet, Nylund shows a deft hand in building this fantastical world. The editors ended the collection on a high note, Anna Niriki Hoffman’s “Sea Air.” In this story, we meet Michael, an adopted teenage boy who has spent most of his transient life attempting in vain to make friends before his father’s sales job forces his family to move once again. As the story opens, Michael and his mother (he is an only child) find themselves in yet another new home near Random, a town just off of the Oregon. Unlike his previous experiences in new towns, Michael quickly finds a friend, Lizzie, who tells him and his mother about the importance of staying indoors at night. Apparently, mysterious “Strangers” haunt the town at dark and are believed responsible for numerous deaths and disappearances over the years. Michael soon discovers that the Strangers may hold the secret to his true heritage — thus providing answers to things such as his fear of water, especially the ocean — and faces a choice between them and staying with his mother, the only person he has ever truly known. Hoffman deftly explores the need to discover one’s roots, the importance of finding a sense of self and belonging, and fear of the unknown and change. “Sea Air” also provides an interesting contrast to “Sea Child,” with which it shares a somewhat similar ending. Overall, Elemental is a worthy addition to any sf collection, even if the profits were not being donated to charity. By showcasing such a fascinating mix of speculative fiction containing a broad range of story types and writing styles—other contributors include Larry Niven, Brian Aldiss, Esther M. Friesner, Martha Wells, and David Drake—this collection contains a little something for everyone. In fact, this collection is one of the strongest original anthologies of short fiction I’ve read in years, and it wouldn’t surprise me to see a few of these stories ultimately land on the short lists for various sf awards. Saville and Kontis should be applauded for putting together such an outstanding anthology for charity. This entry was posted in Alethea Kontis, Book Review, Matthew Appleton, Steven Savile. Bookmark the permalink.